On November 22, 1963, dozens of people in Dallas, Texas lined the streets to watch President John F. Kennedy’s motorcade pass by Dealey Plaza. In the weeks and years that followed, many of their identities became known, while others still go by identifying nicknames (such as "Umbrella Man" or "Badge Man"). Conspiracy theories have abounded since that day, including ones surrounding "Babushka Lady," so-called because the mystery woman was wearing what looked like a Russian head scarf. 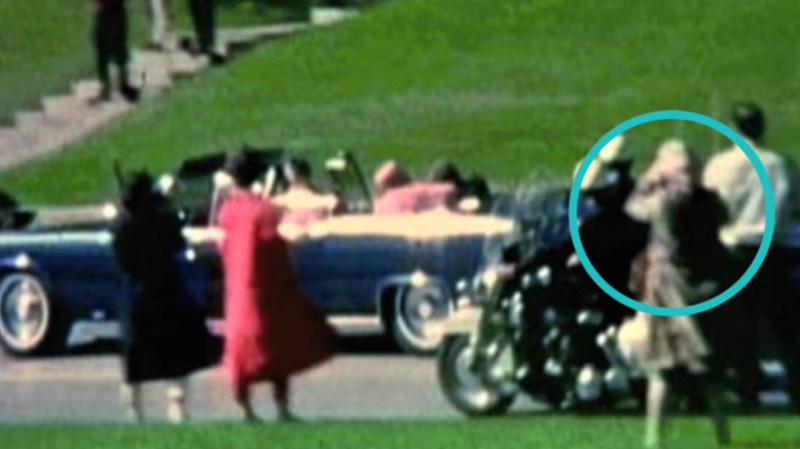 She was standing on the grass between Elm and Main Streets, photographing the moment JFK was shot, and now, 50-some years later, we still have no idea who she is, and whatever footage she may have taken of the president’s assassination has never been found. A number of bystanders in Dallas took photos and videos, to varying degrees of quality, of what became the president’s assassination, and Babushka Lady appears in a few. In Dallas resident Marie Muchmore’s film (which has become one of the primary chronicles of that day), Babushka Lady appears at 0:41, standing behind a man, Charles Brehm, and his 5-year-old son, Joe. We can only see the back of her, but she wears a long tan coat, holds her arms up by her face, and stands with a wide stance. In another video, taken by U.S. postal carrier Mark Bell, Babushka Lady is visible at 0:47 after the shots were fired and the motorcade has just passed by. Her back is to the camera, but she seems to have walked closer to the street and stands across from the grassy knoll. She remains standing, while others around her are running for cover or sitting on the ground in shock. The Zapruder film, which has become possibly the most famous citizen video because it is considered the most complete, offers a frontal view of Babushka Lady at 0:37, but her camera obscures her already-blurry face. Seven years after the assassination, in 1970, a former dancer and singer at a burlesque club named Beverly Oliver claimed to be Babushka Lady. Oliver asserted that she photographed the assassination with her Yashica Super 8 camera, and two FBI agents took the camera from her. Oliver also claimed that she knew Jack Ruby, who supposedly introduced her to suspected JFK shooter Lee Harvey Oswald, saying Oswald was a member of the CIA. (Ruby, of course, went on to shoot Oswald while he was in custody.) Oliver’s story has some serious problems, though, and has been generally debunked. She was a slender 17-year-old in 1963, which clashes with the older woman who appears in the film footage of Babushka Lady. Additionally, the Yashica Super 8 camera wasn’t produced until the mid-1960s. Oliver has backtracked on some of her claims, arguing that her camera was a prototype that she got before it became available to the general public. Conspiracy theories involving Babushka Lady proliferate, with some theories holding more merit than others. Some say she was a Russian spy, an assassin holding a camera gun, a secret service agent, or a man dressed as an older woman (her wide stance for example, as seen in Muchmore's film, could be viewed as a bit unusual for a woman in the 1960s—especially one dressed in a time-appropriate dress and trench). Because it had been raining earlier that morning, some women in Dealey Plaza wore scarves on their heads; but, the rain had stopped at 10 a.m., and since the shots weren’t fired until 12:30 p.m., Babushka Lady wasn’t wearing a scarf to shield herself from active rain. Perhaps she was holding binoculars rather than a camera, which would explain why her photographic or video footage has never been found. But because she never came forward to tell law enforcement what she saw (unlike other spectators who witnessed the shots being fired), her identity (and what she may know) remains a mystery.